So far we’ve brought you 4 pieces in our ‘Barden Payroll Series’. The series was launched with the aim of giving the payroll profession in Ireland some really great specialist advice to help with their professional future. This time, instead of us providing you with that advice, we’ve decided to leave it to the experts working in this field. Introducing Steve Bevan, Senior Manager of Global Payroll, Itron Inc. 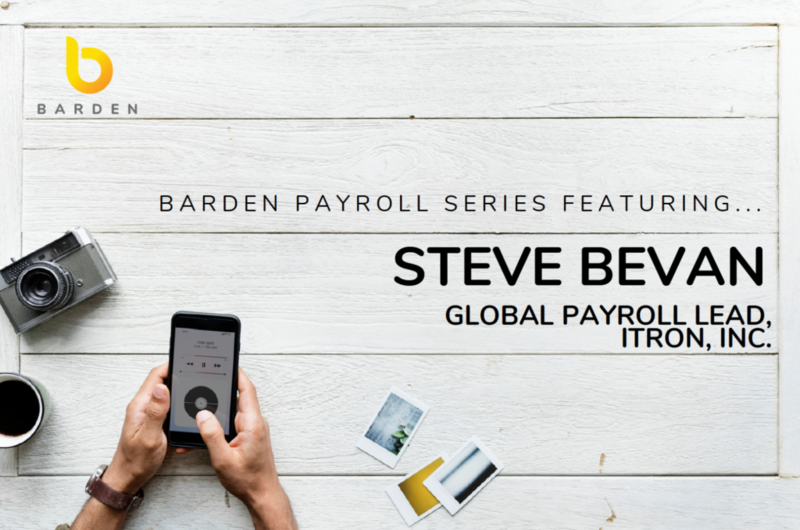 In this instalment of the ‘Barden Payroll Series’ Tara Higgins (Senior Associate, with our Cork team) met with Steve Bevan, Senior Manager of Global Payroll with Itron Inc., to gain an insight into what it’s like to lead and develop a global payroll team. Steve started off his career in the HR space and running the weekly payroll at that point was part of the HR role. From there Steve began working on automating processes for payroll. He began looking at different software, to aid automation, and always wanted to know how to improve things. To get to the bottom of this he started programming and writing reports. Having had a strong sporting background, he was then able to transfer his leadership experience into the payroll function and loved helping people meet their own ambitions. Steve joined Itron in September 2018 and is heading up the Global Payroll Team, who cover the US and Canada, EMEA and the rest of the world. Itron is a global company that enables utilities and cities to deliver critical infrastructure services including electricity, gas and water resources, to communities in more than 100 countries. With over 8,000 people around the globe, Itron established its global business services centre in Cork city in 2014. Since joining his main role has been to help lead the team to the next level, focusing mainly on putting robust processes in place to help develop the payroll team, changing the team structure, streamlining the payroll systems, establishing new procedures to make sure the function is robust, introducing development plans and enabling those on the team to become more skilled in the payroll function. To have achieved all of the above in just 5 months is a great success in leading any team, however Steve stresses none of it is possible without the people. A first step in establishing those support structures was to build the team, including the introduction of new managers and team leads. Part of this meant ensuring regular one-to-one meetings were taking place, and that a robust and repeatable on-boarding process was in place for each person who joined covering plans for day one, week one and month one. For anyone working in payroll it’s well known that payroll plays a pivotal role in any business and can add greater value to an organisation. Something which Steve truly believes. However, ensuring this is understood outside of the payroll team can often be a challenge. As the lead of a global payroll team based in Ireland, we couldn’t leave Steve without asking about his thoughts on the future of payroll in Ireland. Steve also believes that the payroll function provides many opportunities for individuals to develop their leadership skills, which are easily transferrable to other areas of finance and business. Although there are some networks, events, qualifications and organisations in place to support those in payroll Steve feels there is plenty of scope to develop this and essentially to bring the payroll family closer together. For example, the establishment of a payroll forum would be welcome to allow payrollers a space to discuss common issues and support each other in identifying solutions. And Finally, What Do You Think Makes a Good Payroller? Steve would love to give people who join Itron, the experience they are missing to become a great payroll professional. Recently launched the Barden Payroll Series aims to deliver payroll focused content and interviews with the payroll profession, and shine a spotlight on payroll as a career in the Irish market. Feel free to get in touch with Tara Higgins or Niamh Ennis if you’d like to have a chat about the payroll market, career opportunities, building your payroll team or have an idea for a blog.